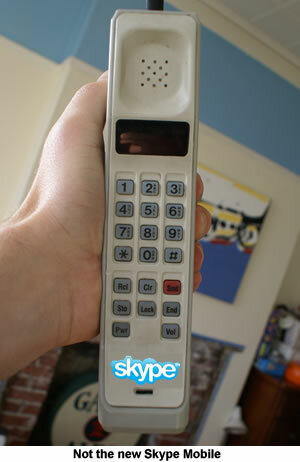 Skype/3 Mobile Phone On Monday? There’s been rumours around for a while now about Skype and mobile operator 3 getting together to offer a dedicated handset allowing people to use Skype on the move. You’ll remember in our world-first review of the 3 X-Series when it was launched in December 2006, we detailed how using Skype on the handset worked. Three’s move to offer the free-to-use mobile phone services was a shocking move to the rest of the mobile industry – and very brave. One that they’ve tried very hard to avoid – doing the equivalent of sticking their fingers in their ears and singing “La, la, la,” very loud. What’s being spoken about now is a handset that just does Skype and mobile Skype Phone, but using 3’s mobile data network to remain connected. Cell Addicted Blog has a quote from Skype spokesman Chaim Haas, picked up from the Reuters report, who went as far as confirming that 3 and Skype “are working together on a new product to make Skype completely mobile,” but no further. Other publications are drawing together the invites that are going to the press to attend an event next Monday, concluding that this must be the launch. As we said before, with eBay owning Skype, there’s a great opportunity for them to get all of the far-east producers currently selling electronic gear on eBay to be making handsets for Skype. With over 10 million people using Skype at a time, that’s a pretty powerful network. Tune back on Monday for the details of what went on :). @jan – Well done … looks like you got the scoop on the shot!